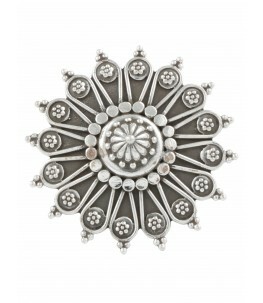 A lovely round button-shaped nose pin with a tiny flower surrounded by engraved edging with a clip-on fastening. With bigger nose pins getting trendier by the day, this piece is perfect accessorize both Indian and western looks. Set in 92.5 Sterling Silver. *Disclaimer: This product has been made by hand and may have slight irregularities that are a natural outcome of the human involvement in the process. © 2017 ahilyajewels.com. All Rights Reserved.